This entry was posted on Tuesday, December 15th, 2009 at 12:44 am	and tagged with Aroldis Chapman, bad fielding, Boston Red Sox, Cliff Lee, deal, errors, Jack Cust, John Lackey, Mike Cameron, Oakland Athletics, Philadelphia Phillies, released, Roy Halladay, Seattle Mariners, signings, trade and posted in Sports. You can follow any responses to this entry through the RSS 2.0 feed. The surprising there if it’s alleged as being true. It is the very fact that Lee apparently didn’t want to be signed to a long term deal. Hence the reason that the Phillies decided to trade him ? I’d have thought that a long term deal would’ve been in Lee’s best interest , but apparently not ? 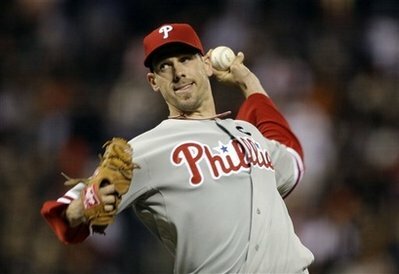 Now with the Phillies adding Halladay to their roster, they again become the team to beat in the NL. As for the Mariners they’ll now become more likely than not the team to beat in AL West . But I still feel that they’re offensively challenged. How much of a mess is the situation going to become in LA , concerning Frank and Jamie McCourt ? That divorce could turn out to be real messy and it may well end up with Frank McCourt having to sell the team ? Given the fact that there’s some dispute as to the validity of the post and pre-nup agreements signed by his ex-wife. There’s only so many ways that $800 million can be sliced up at the end of the day. Just ask Tiger ? Whichever idiot club takes on Mike Cameron, does at their at their cost. The guy is a damn headcase and a raving lunatic. Wherever he’s been he has become a malignant tumor that seems to spread and at some point disrupts an entire organization. He’s simply not worth the risk at all ! That dropped flyball by Cust reminded me of a similar error I made in a tryout period for my freshman year baseball team. I made a dreadful play and was cut from the team a week later. Can’t say I’m sad to see Cust go. He was one of my least favorite A’s over the last decade or so. We might miss Casilla though. Granted he was inconsistent, but my guess is he’ll play a key role for someone else. I love watching baseball games during March-June, it is a good pass time and the fairness of batting, taking turns, and running bases with cheers are unforgettable! So Matsui is said to be Angels’ bound ? I don’t know if that’ll end up being enough to make the Angels still a dominant force within the AL. They do a passable imitation of that within the AL West but more often than not they end up either succumbing to either the Yankees or Bosox , in the end. As far as Sciocsia and Arte Moreno are concerned, you can never have enough offense. But I now think that their Achilles’ heel will now be their lack of real front-line pitching !